The humanitarian crisis in Puerto Rico worsened with the inadequate response by the federal government. Amid criticism, Trump threatened to pull out, but later backed off. Although the death count officially stands at 45, reporting revealed possibly hundreds more preventable deaths related to the Hurricane Maria. Trump remains silent on both California’s deadliest wildfires and the deadliest combat incident since he took office. He continues to focus on undoing Obama’s legacy, piece-by-piece. The Mueller investigation hit Trump’s inner-circle, and social media’s role in aiding Russia continues to unfold. On Sunday, Trump attacked former ally Sen. Bob Corker in a series of incendiary tweets, saying “Corker “begged” me to endorse him for re-election” and “wanted to be Secretary of State.” Trump claimed to have said no to both. On Sunday, Pence left a Colts game after a protest during the national anthem. Pence later issued a full statement opposing the protests. The Colts were playing the 49ers, a team known to protest. Before the game, Pence tweeted a photo of him and the Second Lady wearing Colts gear. The photo was one he originally tweeted in 2014. Shortly after, Trump tweeted he had asked Pence to leave the game “if any players kneeled,” and said he was proud of Pence and the Second Lady. The pool of journalists covering Pence were not allowed into the stadium, and were told, “there may be an early departure from the game.” ABC estimated Pence’s flight cost taxpayers nearly $250k. Bowing to pressure from Trump, the Cowboys’ Jerry Jones, after kneeling with players in week 3 of the season, changed course saying any player who “disrespects the flag” by kneeling will not be allowed to play. On Tuesday, Trump threatened the NFL over protests saying the league is “getting massive tax breaks” and the law should be changed. This claim is false: the NFL gave up its 501(c)(6) tax-exempt status in 2015. On Tuesday, bowing to pressure from Trump and fans, NFL Commissioner Roger Goodell, who previously had said players had the right to voice their opinions, sided with owners opposed to letting players demonstrate. On Monday, Pence headlined a fundraiser in CA for Republicans including controversial, Kremlin-ally Rep. Dana Rohrabacher. Rohrabacher had a previously undisclosed meeting in Russia with Veselnitskaya described in Week 47. University of Wisconsin approved a policy which calls for suspending or expelling students who disrupt campus speeches and presentations. The policy mirrors Republican legislation passed by the state Assembly. On Columbus Day, unlike Obama, Trump celebrated the “arrival of Europeans,” but did not mention of the suffering of Native Americans. On Sunday, the Trump’s DHS allowed the Jones Act waiver, which helped speed relief to Puerto Rico, to expire. No explanation was given. On Friday, Trump addressed the Value Voters Summit hosted by the Family Research Council, which has been classified by SPLC as an anti-gay hate group. Trump is the first US leader to address the group. Reuters reported the Trump regime has been quietly cutting support for halfway houses for federal prisoners, severing contracts with as many as 16 facilities, necessitating some inmates stay behind bars longer. ABC reported the Treasury Dept’s inspector general is looking into allegations reported by BuzzFeed in Week 47 that agency officials have been illegally looking at private financial records of US citizens. A report compiled by the Government Accountability Office (GAO) at House and Senate Democrats’ request, found the Trump transition team ignored ethics officials and refused to cooperate with the GAO. In response to a filing by CREW, Trump’s DOJ told a court in DC that Trump can destroy records without judicial review, including tweets. Brian Brooks became the second candidate under consideration for deputy Treasury Secretary to withdraw from consideration. Mnuchin said he has no plans to fill the number two slot in his agency. WAPO reported at the Interior Dept, when Zinke enters the building a staffer takes the elevator to the seventh floor, climbs the stairs to the roof and puts up a special flag. The flag comes down when he leaves. On Wednesday, NBC reported Tillerson calling Trump a “moron” was provoked by Trump suggesting a tenfold increase in the US nuclear arsenal during a July 20 meeting with the high-ranking national security leaders. In a statement Wednesday night, Republican Sen. Ben Sasse asked Trump if he was “recanting” his oath to protect the First Amendment. Indiana Republican lawmaker Jim Lucas drafted a bill that would require professional journalists to be licensed by state police. Under pressure to confirm Trump’s judicial nominees, McConnell will no longer allow “blue slips,” used by senators to deny a nominee from their state a Senate Judiciary Committee hearing and vote on confirmation. The Trump regime withdrew from United Nations Educational, Scientific and Cultural Organization (UNESCO), citing anti-Israel bias and a being in arrears on a $550 million payment. Israel remains part of UNESCO. Corker said he is concerned about Trump, and Trump’s behavior should concern “anyone who cares about our nation.” He added there is no ‘good cop, bad cop’ underway with Tillerson — Trump is undermining diplomacy. WAPO reported Trump is frustrated by his cabinet and that he is not getting enough credit for his handling of three hurricanes. Trump is lashing out and rupturing alliances with both Republicans and Democrats. Politico quoted 10 sources current and former WH aides who employed strategies like delays and distractions as “guardrails” in trying to manage Trump’s impulsivity. Vanity Fair reported sources say Trump is “unstable,” “losing a step,” and “unraveling.” They say the WH is in crisis as advisers struggle to contain Trump who is increasingly unfocused and consumed by dark moods. Trump allegedly told his former bodyguard Schiller, “I hate everyone in the White House!” Kelly is allegedly miserable in the job, and is staying on in a sense of duty and to keep Trump from making disastrous decisions. According to sources, Bannon said the risk to Trump’s presidency wasn’t impeachment, but the 25th Amendment. Bannon thinks Trump has only a 30% chance of making it the full term. In a column “What Bob Corker Sees in Trump,” conservative columnist Peggy Noonan urged Republicans they have a duty to speak on the record about what they see happening with Trump. On Thursday, at a signing ceremony for his health care executive order, Trump nearly walked out of the room without signing the order. Pence pulled him back in. On Tuesday, Trump said in an interview with Forbes that he could beat Tillerson in an IQ test. Trump met with Tillerson later that day at the WH. On CBS’s 60 Minutes, Parscale claimed he fine-tuned ads on Facebook to directly reach voters with the exact messages they cared most about. He also claimed he handpicked Republican Facebook employees to help. Daily Beast reported the Kremlin recruited two black video bloggers, Williams and Kalvin Johnson, to produce incendiary YouTube videos calling Hillary a racist. The videos were spread on social media platforms. WAPO reported Google has uncovered evidence about $100k of ads purchased by Russian agents to spread disinformation on across the company’s many products, including YouTube, during the 2016 election. Google said the ads do not appear to be from the same Kremlin-linked troll farm that bought ads on Facebook. Some ads touted Trump, Bernie Sanders, and Jill Stein, while others aimed to fan the flames of divisive issues. Rep. Devin Nunes, who recused himself as Chair of the House Intel Committee’s Russia probe, unilaterally signed off on subpoenas to Fusion GPS, the research firm that produced the Steele dossier. Democrats were not consulted. Reuters reported Chuck Grassley, the Republican chair of the Senate Judiciary Committee, is also taking steps to discredit the dossier according to Democrats on the committee. Carter Page told the Senate Intel Committee that he will not cooperate with any requests to appear before the panel on Russia, and will plead the Fifth. Daily Beast reported the House Permanent Select Committee on Intelligence is looking at Cambridge Analytica’s work from the Trump campaign as part of its Russian probe. Cambridge Analytica, which has ownership ties to the Mercers and Bannon, was brought in to help the campaign by Kushner. The company is also under investigation in the UK watchdog for its role in Brexit. NYT reported Israel caught Kaspersky Lab working with the Russian government to search the world for US secrets, using Kaspersky software to scan for classified words. Kaspersky software is used by 400 million people. WSJ reported that Russia’s use of the Kaspersky program to spy on the US is broader and more pervasive than the operation against one individual in Week 47. Trump continues to deny Russian meddling in the US election. Politico reported as part their posture to cooperate, Trump’s attorneys may offer Mueller a meeting with Trump. If Mueller doesn’t ask by Thanksgiving, attorneys may force the issue by volunteering his time. Legal experts were surprised by Trump’s lawyers strategy noting Trump would be speaking under oath and he routinely distorts facts, and that Trump would be interviewed in connection with a criminal investigation. CNN reported Russian operatives used YouTube, Tumblr, and even Pokémon Go as part of their effort to interfere in the election, using a campaign titled “Don’t Shoot Us” to spread a divisive message. NBC reported Manafort had a previously undisclosed $26 million loan from Deripaska through a series of transactions. It is unclear if the $26 million is a loan or an indirect payment from the Russian oligarch. The loan brings the total financial relationship between Manafort and Deripaska to $60 million over the past decade, according to financial documents filed in Cyprus and the Cayman Islands. Maloni’s statement was later revised and that sentence was removed. Both Manafort and Maloni have received subpoenas to supply documents and testimony in the Mueller probe. Yahoo reported Andrew Feinberg, former correspondent for Sputnik, provided a guide and emails to FBI investigators looking into possible violations of the law which requires agents of foreign nations to register with the DOJ. Further, the Senate Select Committee on Intelligence is investigating RT and Sputnik as possible parts of the Russian state-run propaganda machine in the broader probe into Russia’s election meddling. Priebus was present during Trump’s efforts to limit the Russia probe, and for discussions that led to the firing of Comey. He was also asked to leave the Oval Office before the infamous Trump-Comey conversation. Politico reported Twitter deleted tweets and other user data of potentially irreplaceable value to investigators in the Russia probe. Federal investigators believe Twitter was one of Russia’s most potent weapons. Bots and fake accounts launched recurring waves of pro-Trump, anti-Clinton story lines that were either false or greatly exaggerated. AP reported Twitter has turned over 201 accounts linked to Russian attempts at influencing the 2016 election to Senate investigators. It is unclear if the posts associated with these accounts have been deleted. CNN reported an attorney for Roger Stone said he has complied with the House Intel Committee request to provide the identity of his intermediary to WikiLeaks’ Assange. WSJ reported Congressional investigators are homing in on connections between the Trump campaign, and Facebook, and Twitter. Digital director Parscale was paid $88 million during the campaign, the highest paid vendor. Every vendor that worked with Parscale on the Trump campaign signed a nondisclosure agreement, and there are no federal disclosure requirements for online ads. Both Congress and Mueller are investigating the role activity on Facebook and Twitter played in the 2016 election, and whether the Russian social-media activity was in any connected to the Trump campaign. A Morning Consult poll found Trump’s approval has fallen in every state since he took office. The swings were as high as 30 percentage points in blue-states IL and CA, to 11 points in red-state LA. A Reuters/Ipsos poll found Trump’s popularity is eroding in small towns and rural communities: in September 47 approve/47 disapprove, down from 55/39 in his first four weeks in office. WAPO reported as of October 10, Trump’s first 263 days in office, he has made 1,318 false or misleading claims. The Brookings Institute released a 108-page report which concluded Trump “likely obstructed justice” in his firing of Comey. If Mueller agrees, there are legitimate articles of impeachment that could be drawn up. In a letter to Mattis, over 100 Democrats are demanding proof that Trump did indeed consult with the Pentagon as he claimed in a tweet, prior to announcing his ban of transgender individuals from military service. A Kaiser Foundation poll found 62% of Americans say Puerto Ricans aren’t getting the help they need. 76% were aware Puerto Ricans are US citizens. At a House Energy and Commerce hearing about efforts to rebuild the island’s energy grid, Sec. Rick Perry referred to Puerto Rico as a country. Next day, Trump referred to the Virgin Islands’ governor as a president. VOX reported although the official death count in Puerto Rico is 45, they found 81 death linked to Hurricane Maria, as well as 450 more reported deaths, most of causes still unknown, and 69 still missing. Puerto Rico’s governor said four deaths are being investigated as cases of leptospirosis, a disease spread by animals’ urine through contaminated water. A total of ten people have come down with the disease. Rachel Maddow reported a doctor resigned from the disaster response team in Puerto Rico after seeing medical workers getting manicures and pedicures from residents of the island in medical triage tents. NYT reported on Puerto Rico’s health care is in dire condition, and continues to suffer from mismanagement. The US Comfort ship with 800 medical personnel which can serve 250, has seen 82 patients in six days. CNN reported Puerto Ricans are drinking water from a hazardous-waste site, having no other options for water. A Politico/Morning Consult poll found just 32% of registered voters think the federal government has done enough to help Puerto Rico. Bloomberg revealed one of its reporters was inadvertently put on the Pentagon’s internal email list which detailed how to spin Hurricane Maria to convince the public that the government response was going well. On Thursday, Trump also signed an executive order ending Obamacare subsidies for the poor. Not paying the subsidies could boost premiums for millions and send the health insurance exchanges into turmoil. NPR estimated consumers who earn 400% of the federal poverty level — $48k for individuals or $98.4k for a family of four — will see their the cost of their plans rise by, on average, 20% nationwide. Doctors, hospitals, insurers, state insurance commissioners and patient advocates denounced Trump’s move. Trump actions puts pressure on Congress to protect consumers from soaring premiums. WSJ reported if Congress doesn’t succeed, WH aides said Trump “will claim victory” for ending the Iran deal, cutting billions in payments to health insurers, and deporting hundreds of thousands of immigrants. On Friday, a coalition of attorneys general from 18 states and DC filed a lawsuit to block Trump’s halt to subsidy payments under Obamacare. NYT reported as of Friday, Trump has taken 12 actions which could weaken Obamacare and curtail enrollment, including spreading negative news releases and posting infographics criticizing the health law. On Saturday, Trump boasted on Twitter that health insurance companies’ stocks “plunged yesterday” after his steps to dismantle Obamacare. A Kaiser Health poll found 71% of Americans say the Trump regime should work to improve Obamacare, while just 21% say make it fail. Top officials on Trump’s national security team, including Mattis and Tillerson, said Iran has technically complied with its restrictions. The International Atomic Energy Association also confirmed compliance. Daily Beast reported while McMaster also wanted to save the Iran Deal, Trump consulted Fox News’ Sean Hannity and former UN Ambassador John Bolton, two neoconservatives who pushed for decertification. The leaders of Britain, Germany and France declared their commitment to stand by JCPoA. They deal was the culmination of 16 years of diplomacy. After being added to Trump’s travel ban, Chad pulled its troops from the fight against Boko Haram in Niger. US officials had warned Trump his decision would have major consequences for the fight against terrorism. California’s deadliest wildfires charred more than 221,754 acres of land in Northern CA, and left at least 35 dead and hundreds more missing. Trump has yet to publicly comment or tweet about the wildfires. Nor has Trump publicly commented on the deadliest combat incident since he took office, which took place in Niger last Saturday while Trump was golfing. The ambush by ISIS left four soldiers dead and two wounded. As the week ended, 24 days after Hurricane Maria, just 64% of Puerto Ricans had access to drinking water, and only 14.6% had electricity. Trump spent his fourth weekend since Hurricane Maria golfing. On Saturday, he visited Trump National Golf Club in VA, his 72nd day of golf since taking office. Photo caption: 24 days after Hurricane Maria, just 64% of Puerto Ricans had access to drinking water. Four deaths this week were due to water-born leptospirosis. 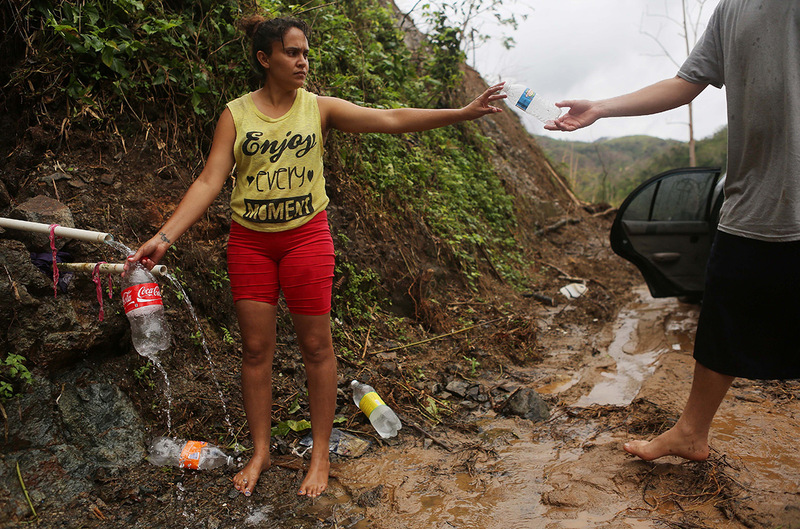 24 days after Hurricane Maria, just 64% of Puerto Ricans had access to drinking water. Four deaths this week were due to water-born leptospirosis.